When it comes to unhealthy habits, there are many that are universally acknowledged: smoking, eating too much junk food, tanning beds, skimping on your sleep. But what about cooking with the wrong oil? Sitting all day? While they might not be as well-documented, many seemingly harmless daily habits can actually wreak havoc on your health—more than you might expect. If you could stop a habit today, what would it be? Is it one of the more obvious ones or something you may not have thought of? Overhauling your bad habits now with six slight adjustments will not only make you feel better in the short term, but you’ll be setting the groundwork for a healthier tomorrow, too. Maybe you were lucky enough to be able to eat whatever you wanted when you were younger—2 a.m. pepperoni pizza deliveries in college; chicken wings and mozzarella sticks watching the big game on the weekends; burgers and ice cream sundaes on nice summer weekends—but now, all those meat and dairy binges might be catching up to you. Studies show that as you reach middle age, regularly consuming a diet high in animal proteins (meat, fish, eggs or diary, for example) means you are four times more likely to die of cancer or have an earlier death in general, compared to someone with a diet low in protein. The same study suggested this can continue to change as you age—protein controls a growth hormone (IGF-1), which helps us grow, but also makes us more susceptible to cancer. Since levels of IGF-1 decline as you age, those over 65 with a high-proteindiet can actually benefit from more meat. So, while protein protects you as you age, it’s important to not overdo it between the ages of 45 and 65. Put simply, eat more plants. In the study, researchers found that eating more plant proteins, like those found in beans and pulses, do not seem to have the same risk of disease or death as eating animal proteins. The amount of protein you need depends on how much you weigh. According to Becky Hand, the recommended dietary allowance (RDA) as established by the Food and Nutrition Board of the National Academy of Sciences is based on body weight. For a healthy adult, 0.8 grams of protein per kilogram of body weight is ideal. That is roughly 54 grams daily for a 150-pound female, or 71 grams daily for a 195-pound male. That’s not to say you should stop eating meat entirely. Some animal protein is okay, just in moderation. To mix up your protein intake, try incorporating Meatless Mondays into your meal planning, and add beans and other legumes, milk alternatives, tofu and soy products, nuts, seeds and nut butters to your diet. It’s no secret that a sedentary lifestyle is not good for you, but spending the majority of your days on your tush could be worse than you realize. It’s so bad for you, in fact, that it’s been linked to all sorts of things you probably will want to—wait for it—sit down to hear about. A 2015 study discovered that sitting all day at work, watching TV all night and spending a good amount of time in the car can all lead to cancer, heart disease and even death. The researchers of this same study agree that not being active can put you at more of a risk of death than being obese. Get moving! Not only is physical activity great for you for many reasons, even just a moderate amount of activity was shown to slow the risk of death. In fact, a recent article published in The Lancet found that an hour of moderate physical activity was needed to combat the increased risks associated with sitting all day. If you’re unsure where to start, work to incorporate even a few minutes of physical activity daily, and slowly increasing the amount of time you move and exercise as you feel stronger. Other ways to get moving include spending part of your day standing at your desk, walking to work, standing while talking on the phone or eating lunch, walking and talking with co-workers instead of sitting in a conference room or working out during your lunch hour. If you find yourself with zero motivation, see if one of these ideas will give you a boost. Attention-grabbing headlines might scream that you need to be cooking with coconut oil, lard or butter to avoid ingesting oxidized fats and increasing your risk of heart disease, cancer, dementia and other illnesses. However, with proper cooking methods, your oil will not oxidize in your frying pan. Despite what the headlines want you to believe, there is no need to start using other options as your go-to oil. Every oil starts to degrade once it reaches its “smoke point,” which varies from oil to oil. If you accidentally end up with smoking oil, dump it out and start over again before cooking your food. 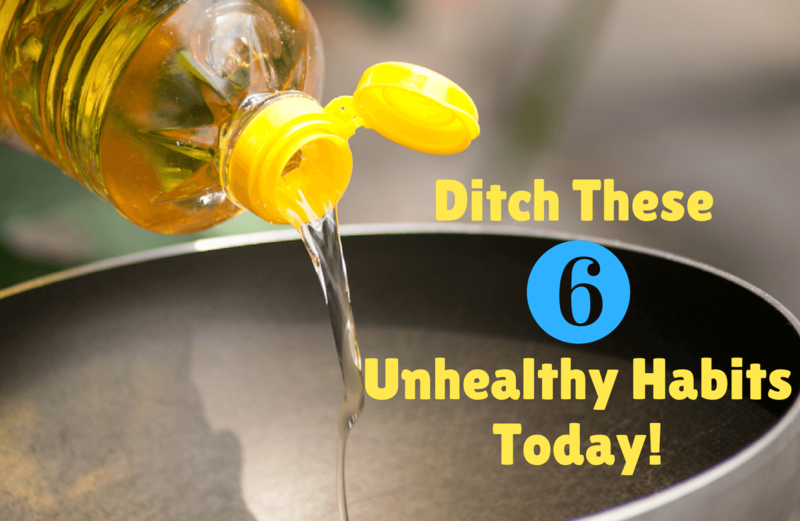 It’s important to select the right healthy oil for your cooking needs. Oils with a high smoke point are ideal for sauteing, frying and other high-heat applications. For those meals, opt for oils with a smoke point of 445 degrees or higher, including super-high-heat canola, super-high-heat safflower, sunflower, sesame or almond oil. Use canola, grapeseed, walnut, safflower, olive, peanut, corn or soy oil—all of which have a medium smoke point of 350 degrees to 425 degrees—for sauteing and medium-high-heat applications. Sure, candles smell nice and add a lovely ambiance to a dimly lit room, but have you thought about what are they doing to the environment inside your body? Scented candles made from paraffin (a petroleum-based product) emit toxic fumes that can lead to lung damage, asthma or even cancer. The same can be said for plug-ins, gels, aerosols and incense. Consider burning unscented candles, lighting scented candles or using air fresheners less frequently or using them in a well-ventilated area. If you can’t bear the thought of being without a candle, look for beeswax, soy and other vegetable-based candles, which don’t produce pollutants when burned. Also, try spritzing your favorite perfume on to your pillows or making your own potpourri to freshen up your living area. Tell the truth: Are you biting your nails right now as you read this? Now is the time to commit to taking them out of your mouth for good. Not only are they full of bacteria from everything you’ve touched all day, but they also may contain fungus and contain added toxins when polished. Plus, they make hangnails more painful, cause tooth damage and have the added con of making you look anxious in public. Not a good look. This one is tough because often nail-biters don’t even know they’re biting their nails. The bad habit is a tough one to break, but it’s not impossible. The best strategy for keeping your hands out of your mouth is to keep them busy. Take up a hobby, chew gum, drink water, drum your fingers on a table, twiddle your thumbs or put your hands in your pockets. Keep your nails looking good by getting regular manicures, filing your nails and pushing cuticles back so you’re less likely to damage them with your teeth. You’ll be less likely to chew up your nails if you put a lot of work into them. While you might think bottling up your emotions is a good thing, holding your emotionsin can actually make everything worse, much worse. Holding on to negative, painful or sad emotions can cause your body to release a constantly elevated level of stress hormones that it cannot sustain for long. The stress hormones cortisol and adrenaline can weaken your immune system, give you headaches, anxiety, bring on weight gain or exacerbate any pre-existing conditions. Learn to share your thoughts and feelings with a trusted friend or partner. If you’re not comfortable opening up to someone right away, try journaling. After a couple weeks or a month of expressing your feelings on paper, you might be more easily able to transition to talking with someone in person. Knowing someone understands what you are going through is a great way to release any bottled-up tension you may have been holding on to, and help you feel more connected to someone. Sometimes, making a change for the better in other aspects of your life can transfer to any emotions you are battling. For instance, eating a healthy diet, exercising, taking up a relaxation technique such as yoga or volunteering are all activities that can make a change in your life for the better. Don’t be afraid to seek professional help if needed or trying one of these stress busters. Pay attention to your environment and any habits you may have that you want to work on getting out of your life. With a little knowledge and know-how, you can kick your bad habits to the curb in no time. Your future self will thank you.